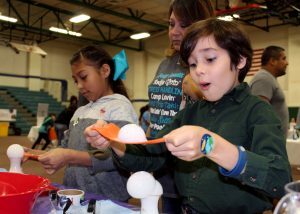 (HARLINGEN) – Eight-year-old Leonard Fuller experimented with sublimation bubbles – converted from a solid to a gas – during Texas State Technical College’s first “Chemistry is Out of This World” event recently held at the Wellness and Sports Center. The homeschooled student said he enjoys studying science and chemistry. He hopes to become a scientist when he grows up. The event hosted by TSTC’s Challenger Learning Center and Chemical Technology was a half-day event filled with hands-on activities for families with a goal of exposing young children to Science, Technology, Engineering and Mathematics (STEM) programs and careers. Activities such as building a battery, molecule creation, bubble sublimation, HoloChemistry mixed reality, rocket reactions and planetarium shows were only a few that the more than 100 attendees got to enjoy. 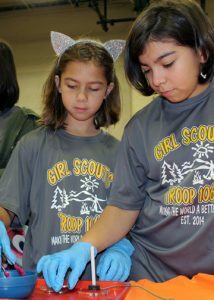 For Lola Mejia from Girl Scout troop 1065, the rocket reactions activity launched her interest in chemistry. The 11-year-old now has two possible career choices. “Chemistry is Out of This World” was made possible by a grant the TSTC Challenger Learning Center received from the National Informal STEM Education Network, a community comprised of informal educators and scientists dedicated to supporting learning about STEM across the United States, provided all of the supplies necessary for the hands-on activities. Mendoza said this event and the services the Challenger Learning Center offers throughout the year are aligned with the Texas Essential Knowledge and Skills, state curriculum standards set forth for public schools K-12. Neri Balli, state director for pre-college programs, said the event was a success. The next community engagement event “Journey to Mars,” will be held December 1 at the TSTC Cultural Arts Center, in partnership with a National Aeronautics and Space Administration (NASA) cooperative. This event will celebrate NASA’s 60th anniversary and the TSTC’s Challenger Learning Center’s fifth anniversary. The event is free and open to the public and will consist of toddler and school-aged children activities such as rover building, computer coding, Mars habitat drawings with three-dimensional pens and rocket assembly. For more information on the Challenger Learning Center and to register for Journey to Mars call 956-364-4125 or visit bit.ly/JourneyToMarsHarlingen.